Vehicle accident victims sometimes experience serious internal injuries, including damage to the spleen. A soft, spongy organ found under the left rib cage, the spleen is near the stomach. It generates new red blood cells, stores extra blood until it's needed, and contains white blood cells capable of destroying bacteria and fighting infection. Spleen injuries stemming from car accidents can lead to serious complications. The spleen can rupture when the abdomen suffers a severe direct blow or blunt force trauma during a vehicle accident. This may occur immediately following the collision, or days or weeks after the accident. 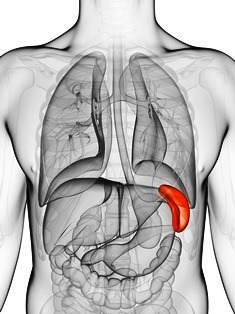 While these symptoms are typical of organ damage, it's possible to suffer a spleen injury without experiencing any immediately obvious symptoms. Evaluation by a medical professional is the safest and best approach. If the damage is minimal, a ruptured spleen may be healed with blood transfusions and bed rest. However, more serious ruptures can require immediate surgery to stop the bleeding, and a severely damaged spleen may have to be repaired or removed. If you’ve suffered spleen injuries due to a vehicle collision, you deserve compensation for your medical costs, loss of income, physical impairment, and pain and suffering. An experienced vehicle accident attorney can identify the parties responsible for your injuries, obtain the evidence needed to prove your case, and help you receive the compensation you deserve.